Excalibur Castle 5in1 Obstacle Combo Buy It today! Setup Area: needs a 21’ x 20’ area for set up. Age Group: perfect for 5 years to 10 years. Tomorrow's bounce house available for your child today and is perfect for children who have had bounce houses before, and want something more - jump up to the next level when they've outgrown a regular bounce! Special new 5 in 1 Combos are the ultimate in inflatables for your party! Children will climb obstacles, bounce, shoot hoops, scale the wall and slide in the wonderful, and colorful Combo Five in One inflatable! An awesome children's party idea! So take your child's party to next level when they've outgrown a regular bounce! 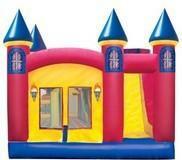 The Excalibur Castle 5 in 1 combo rental is for your Prince or Princess and their subjects to moonwalk, bounce, climb and slide safely. Kids will have a blast navigating through 4 different obstacles in our 18’ Obstacle course before they enter the bouncer. In the bounce, they can bounce or shoot hoops. With a bounce area of 115 square feet, there’s plenty of room for fun. But the Fun doesn’t stop there! Kids will love climbing up to the top of our 13’ Slide. From there, they’ll experience the tallest Combo Slide in the Industry, with a 50 degree sliding angle! Like all of our Combos, this Slide is completely enclosed for safety. The Excalibur Castle 5 in 1 jump, climb, obstacles, hoops and slide combo rental will be delivered to your home or party/event location and be set up for you. Book it today before someone else does!